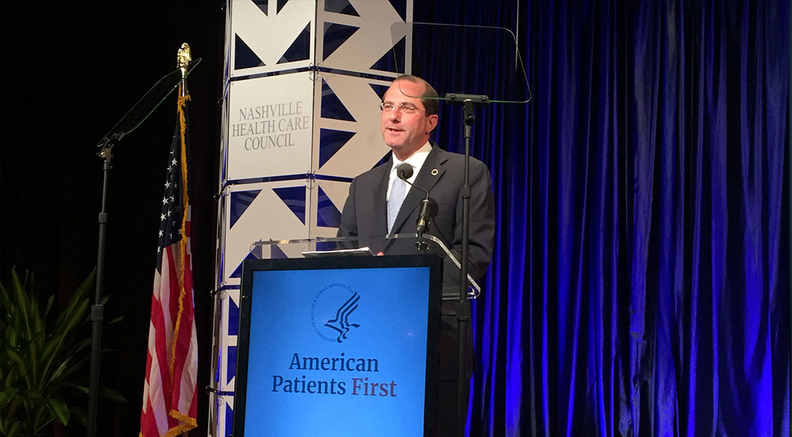 NASHVILLE — HHS Secretary Alex Azar on Thursday praised President Donald Trump for taking "decisive action" to stabilize the individual insurance market and lower health insurance exchange premiums for American consumers. Health insurers have proposed to reduce benchmark exchange premiums by 2% in 2019 following years of increasing rates, Azar said, providing evidence that the Trump administration's moves to gives states flexibility to prop up their insurance markets and expand the types of health plans allowed have been successful. "The president who was supposedly trying to sabotage the Affordable Care Act has proven better at managing it than the president who actually wrote the law," Azar said, speaking from Lipscomb University in Nashville, Tenn., to a room of healthcare executives. He was introduced by Tennessee Gov. Bill Haslam and Milton Johnson, CEO of for-profit HCA Healthcare. Azar outlined what he called the failures of the Affordable Care Act, including rising premiums and limited plan choice. He held up the Trump administration's moves to zero out the individual mandate, cut off certain federal subsidies, and expand short-term plans and association health plans as actions that helped right those failures. Premiums in many states are rising more modestly than in recent years or even falling in 2019. But health reform experts, several insurers and state regulators say that's the work of the state insurance departments, many of which are implementing reinsurance programs or state-based individual mandates to blunt the effects of the Trump administration's actions. Premium increases are also stabilizing because insurers hiked them last year. "ACA premiums are stable for 2019 because they went up so much this year due to an uncertain environment and regulatory actions by the Trump administration," countered Larry Levitt, senior vice president at the Kaiser Family Foundation, on Twitter Thursday. "Premiums would be going down a lot if not for repeal of the individual mandate penalty and expansion of short-term plans." Azar next warned the audience that the concept of "Medicare for all" that some progressive Democrats are pushing would lead to disastrous results. "The main thrust of Medicare for All is giving you a new government plan and taking away your other choices," he said, adding that "broadening the Medicare system would undermine the security and access seniors currently enjoy, come at a staggering cost to taxpayers, and ignore what seniors are showing they want from Medicare today." He warned that Medicare for All would be expensive to the government and taxpayers, and that doctors would start to only accept cash if forced to accept low Medicare rates. "Advocates of Medicare for All are looking backward," Azar said, "not just by repeating the flaws of the Affordable Care Act, but also by trying to impose a payment system designed in the 1960s on all of American healthcare."